I had to admit some skepticism at the idea of doing nothing but blending up a banana and getting ice cream, but the results are truly surprising. Prepping the bananas is simple. If, like me, you’ve all ready got some bananas in the freezer, you can just pull them out and peel them, then cut them into chunks. If you haven’t frozen them yet you can either peel then freeze then cut up later, or peel them, cut them up and then freeze. It’s probably going to depend on what freezer space you have. You do want to make the chunks fairly even in size, and not too large so the blade cuts up everything properly. 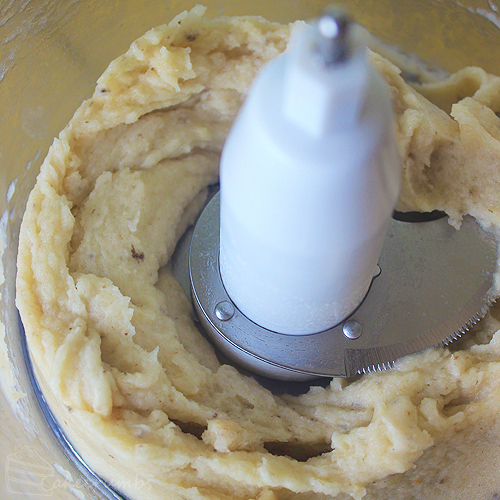 Then it’s simply a matter of throwing it in a food processor and pulsing it until you get a smooth, creamy ice cream. It will turn from tiny chunks to a smooth texture very quickly. You don’t want to blend it too much, as if you keep going the heat of the blades will start to melt it. Just look for the texture, taste a bit to make sure it’s not grainy and you’re done. You can eat it immediately, or put it in a container and keep in the freezer. Of course, there’s no need to stop there. 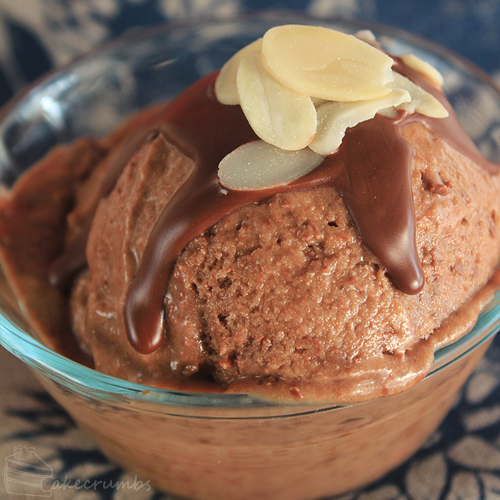 Once you’ve turned a few bananas into ice cream, you can add whatever you want. 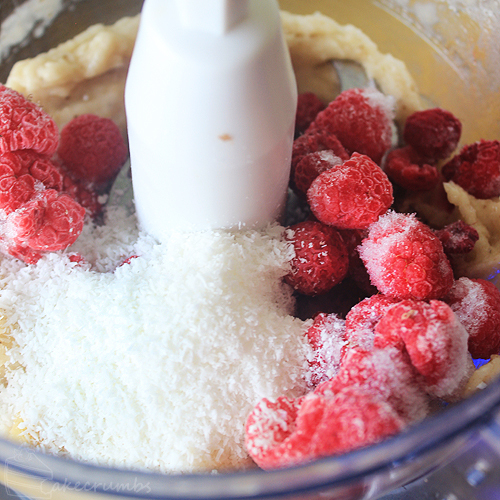 No recipe, no measuring: throw whatever you like in the food processor until it tastes how you want it to. I blended the raspberries completely so they’d lend their colour to the ice cream, but if you want them chunky you can just quickly pulse it or even fold it through the ice cream. And with the last batch of bananas, I kept adding teaspoons of nutella until it was chocolatey enough. 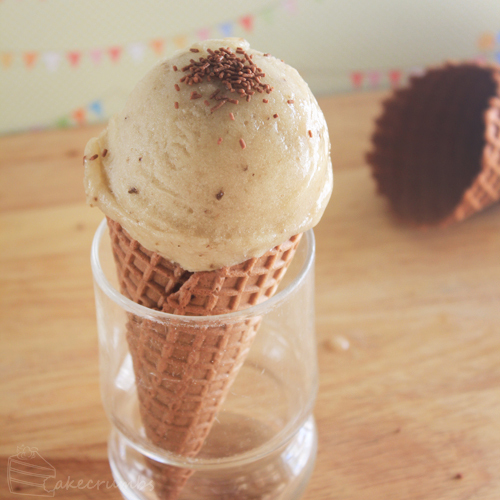 If you’re adding any unfrozen ingredients in, you may want to quickly refreeze the ice cream before serving. It probably owed a little to how warm room temperature was here, but it needed an hour back in the freezer before it was okay to serve. Rhiannon! I’ve been a follower for a while…….LOVE your fabulous cakes! 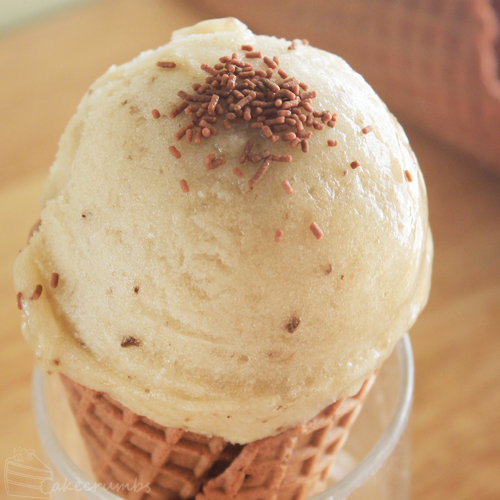 Last year a friend (I’m in SEQ) gave me a recipe for Lime icecream! So yummy and decadent….you wouldn’t believe! Anyway (hey it’s summer isn’t it) I bought an inexpensive Icecream maker! I’ve done the banana iccream! 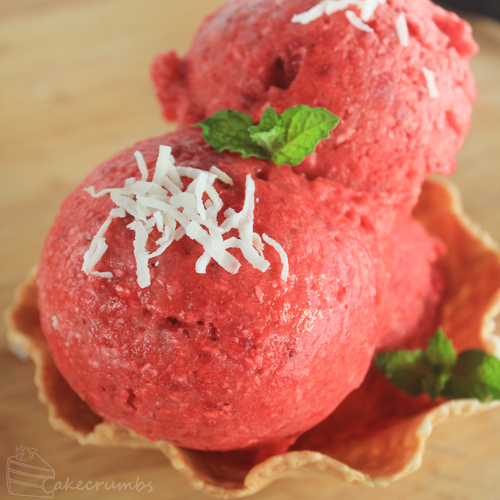 I’ve made sorbets! Our summer is DIVINE for iced creams! It’s PERFECT for the Aussie summer! Thanks so much, that’s quite lovely of you! I definitely think I’m going to crash your kitchen haha. I’m trying to resist getting an ice cream maker, but the thought of being able to make any kind of ice cream ever is just soooo tempting. Corinne! 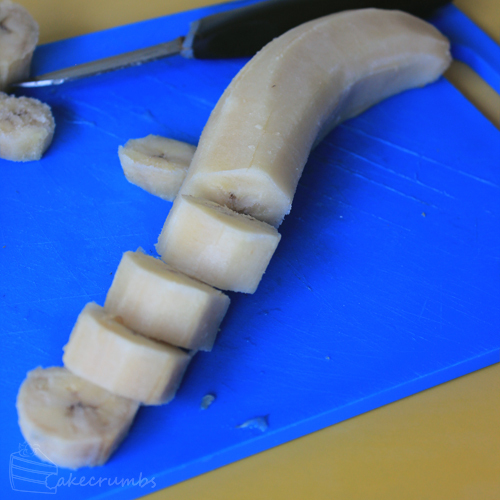 Try mashing the banana with a fork (or even a potato masher ) first. You should be able to use an ordinary cake mixer then. I’ve never heard of such a simple ice cream recipe. Looking forward to trying these out! I’m definitely going to try this out. Probably not when it’s sub zero temperature here in Erie, so it looks like I’ll be waiting for a month or so. As to your banana question: I know I’m one of the people that only like an even amount of bananas. If there’s 5, I’ll rip off one. Usually it’s because I’m making banana nut bread and I only need 2 bananas at a time (and this isn’t a recipe I could just half). I also am rarely in the mood for eating a banana. Granted, I could just stuff the extra banana in the freezer, but I have never liked frozen bananas. I feel like my breads or pancakes don’t turn out as well with them. Y’know, on my deviantART a few people commented saying they don’t like eating bananas. I’m amazed! I thought it was the one fruit everyone loved. Even my fruit-hating sister will eat bananas haha. I am definitely trying this recipe soon. I even have frozen bananas waiting for me right now and you already know I have nutella too. 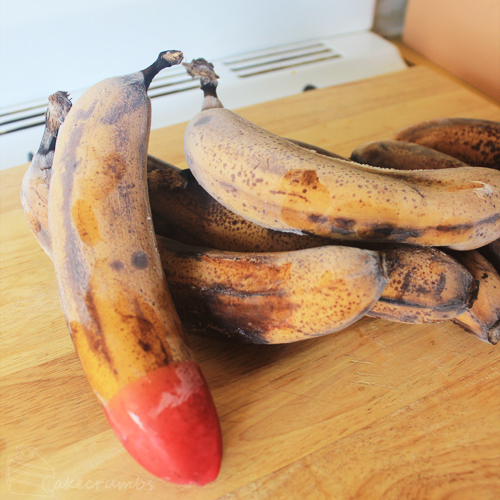 Question, why is the tip of that banana red? It’s a wax tip that signifies where it came from. There’s a farm in QLD that make what they call ‘eco’ bananas. They’re really low on pesticides/agrichemicals and fertilisers etc so it’s better for the environment. They’re also a bit sweeter and denser than the regular bananas. Apparently they also have a longer shelf life but idk, I ignore bananas until they start to get freckles. Wow, this looks so, so YUM! 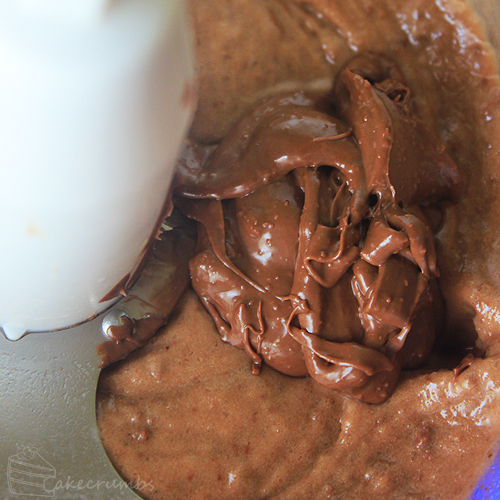 I do not own a food processor, but do you think a regular blender would work? If it’s a decent blender it should be fine. I know my old one would struggle with anything other than milkshakes haha. But either way you can only find out by trying! And if it doesn’t work you can mash it up and use it in a banana cake instead. first of all, thank you for all these amazing recipes ans inspirations. I love them all and I wish I could try them all at once, but since it’s a hot summer I thought about trying this first. But there is one problem that occurred to me. I have tried to freeze bananas before but until now it only worked without the peel for me. Otherwise they turned totally unhealthily brown and the insides became…I don’t know strange…. Is there something I could have done wrong? How long are you storing them? I’d never had a problem before, but since my boyfriend got me an ice cream maker for my birthday I’ve had a few in the freezer since April. Time has not treated them so kindly. If you think the bananas are gonna be in there for quite some time, probably best to only freeze them with the skins off.